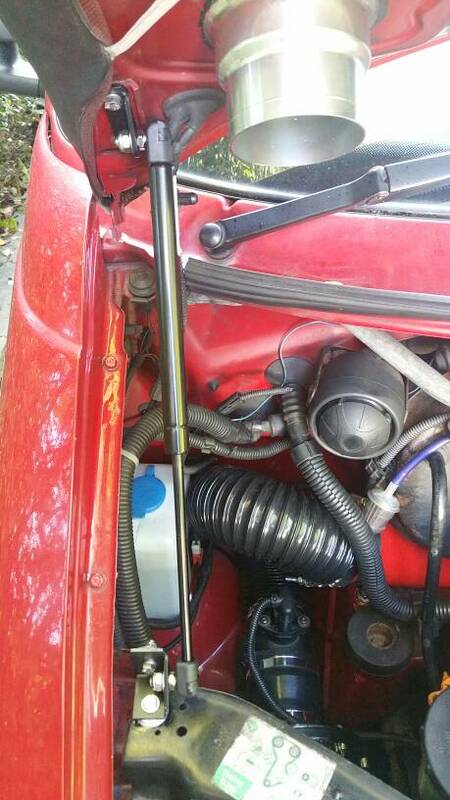 Fitted the bonnet strut. Which works a treat but it's taken a few lifts to get used to it as I kept shocking myself when it rises automatically.... . Only criticism I have is that the headlight bracket sits skew on top of the top headlight plate as there's a pressed upturned edge it sits on. I stuck 3x large 1mm washers underneath to square it up temporarily but will find something better in due course. I also removed the rubber grommet from the stay and fitted another large washer backing plate to make it solid. Check your bonnet alignment after fitting the top plate. Great for the money. My kit turned up a while ago, not even looked at it - but from an aesthetic point of view, that bracket is the wrong way round and the strut is mounted the wrong side of the bracket. Poor design if that's the way it should be. Yep. The lower bracket only fits that way. Fitting it the other side, the bracket fouls the strut when closing the bonnet. A bracket redesign placing the strut in front of the old stay hole would be nice and straight. Last edited by Activ8; 6th November 2018 at 12:24 PM. I was looking at putting the ball in the hole meant for the washer pipe clip and not using the bracket. For the money it's worth what's provided and works just fine. I'll call in at SGS and have a chat about different fixings for the strut then change it when it needs replacing. Pulled two thinner struts (same length etc. from a scrapped Saxo boot that'll work aswell. Believe me .... I wanted it true to the wing line and in stainless! I had a minor paddy when I went out to fit it.... needed a tea break then F'it put it in and fix it next time and better than carrying the stay in the van! No worry regarding excess van payload - It's on the garage shelf next to the K&N .......and the CV boot......and the new USB socket........and the tailgate parts.......and the new aerial lead. Even got a couple of stickers from the pod I've not got round to fitting yet! I use these calcs when switching MAF (or airmass) based smoke limiters to MAP (air pressure) based smoke limiters. At sea level 1000mg/s passes through the vans sensor housing at 0 degrees Celcius, so at a mapped 18:1 AFR (Air Fuel Ratio, burn is smokeless) the mapped van adds 55.5mg/s diesel. So, using the same AFR of 18:1, you can actually add 68.36mg/s, or 23% more fuel for the same air! The inverse is also applicable where insufficient fuel is not supplied to the boosted air. So, 1230.5 mg/s from the MAP calc above , from the MAF map you only added 55.5mg/s fuel the AFR is 22:1 and a 23% less efficient burn than planned. Or 50.8% against diesels best/efficient burn of 14.7:1 AFR, but that would be rollin coal until the van was up to temp! Manufacturers map the cars between 16.5 to 20.5 over the rev range in my experience. This is a guide - there are other factors to consider (air density, humidity, volumetric efficiency, air temp, boosted temps) but you get the drift. Have fun and think about it when you're playing with turbo chargers and fuelling! Last edited by Activ8; 7th November 2018 at 03:52 PM. Oh yea it is definatly a bargain.